Fairy Cardmaker: January Jackpot at EFA! 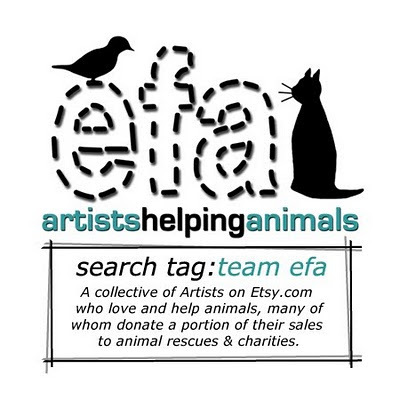 Etsy for Animals (EFA) is a team of artisans and crafters who support animal causes. Each month, there is a team challenge and the creations are showcased on the EFA challenge blog. Members are encouraged to submit challenge ideas. This month, the challenge is one that I submitted: January Jackpot! The challenge is to use gold somewhere in your item. 10% of the proceeds of this card will go to SOAR: Southern Ontario Animal Rescue. This charity rescues dogs and finds them foster homes until later adoption. It is a very small organization and it needs all the help it can get - even my pennies per card! Remember to check out the EFA challenge blog for more January Jackpot entries! I love always finding such diversity from a single theme! What a great idea to help such a worthy cause. I love that you use your passion to help and challenge others to do the same.